If you've been following us online, you may know that we opened up a small retail store and creative space in the Mount Pleasant area here in Vancouver last April. With our lease coming up next month we had to decide recently if we were going to renew. After much contemplation we have decided not to renew as we've come to the conclusion that the location, space size along with the lease just doesn't make sense for us to continue at that location. It's a little sad to let it go, as we love the space. The shop has also been a blast; we've met so many great people who knew about our online world, and others who just stumbled upon us and liked our displays. We had visitors from all over the world and it was a fun way to connect. We are still wanting to continue having a space, especially for our workshops, so we are currently keeping our eye open for a bigger space in a better location. Not sure if that will happen right away, as we want it to be a good fit. 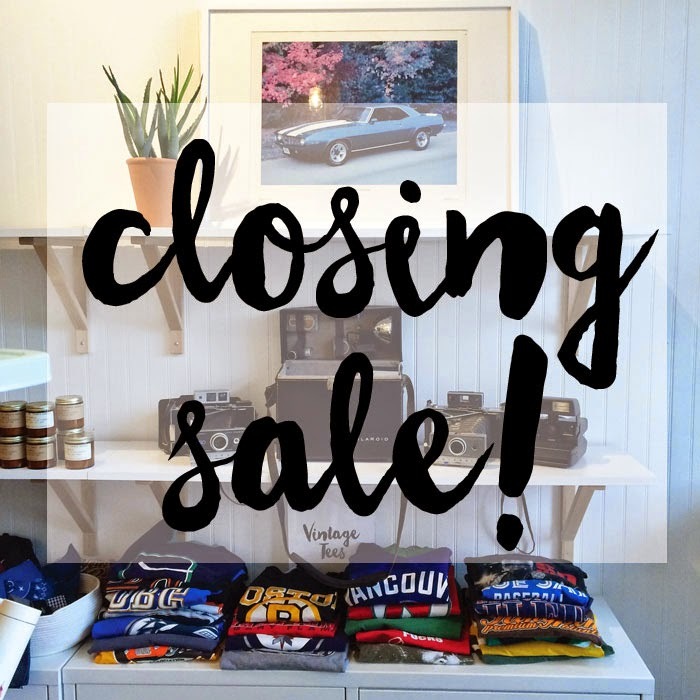 So, to mark and celebrate our year in that location and for our impending move, we're throwing a huge storewide closing sale starting this Saturday, March 7/15. Up to 50% OFF! (FYI - The shop will be closing at the end of April). Hope to see you! We'll still be here at the blog though - 10 year anniversary coming soon! A new beginning then...! I'd come if I could, beleive me! I know I would looove your shop! Hope you're going to find a new place. Have a good day! Lyndsay - yes bittersweet. Thanks! Lady Grey - that would also be so cool. thank you! Oooh, I wish I was there! I´m sure that I´d love your shop. Best wishes! Oh Jan & Earl, what a hard decision to make! Your shop is so lovely, but I love that you've got the guts to know that it's not the right fit and move onwards. Congrats on the 10 years of blogging coming up! Thanks Jeannette! It was a hard decision, but we learned a lot. And thanks on the 10 years! Congrats back to you on your 10! I'm so glad I was able to make it in before you close! Hopefully I'll be able to make it to a workshop in your new space when you find the perfect fit. All the best in the search! I'm sorry to hear about the shop, but I'm glad that I got to enjoy some time there at your Photoshop workshops recently. Good luck with your hunt for a new space! 10 years! Wow! And I need to pop in before you close. I am on spring break now...maybe a trip to Vancouver is in order!